(TibetanReview.net, Jun22, 2015) – Tibet’s top religious figures have on Jun 20 condemned those among the controversial Dolgyal spirit worshippers who make false allegations and continue a hate campaign against the Dalai Lama. 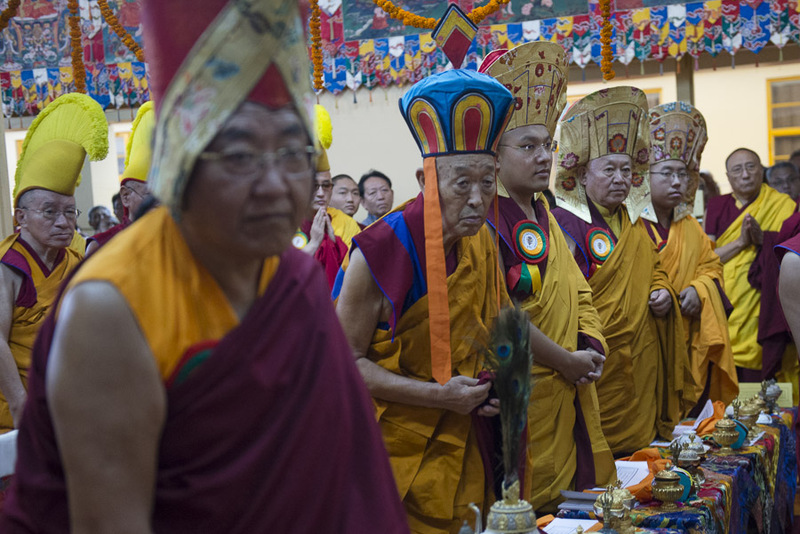 They made their position clear at the conclusion of the 12th Religious Conference of the Four Schools of Tibetan Buddhism and Bon Tradition held at Dharamshala, India, over Jun 18-20. The religious leaders expressed gratitude and appreciation to the Dalai Lama for his concern for the Tibetan people and Buddhists worldwide, and for truthfully explaining the harmful effects of propitiating Dolgyal. They pledged, under the leadership of their respective spiritual heads, to wholeheartedly follow the Dalai Lama’s advice and urged others to do the same. The conference reviewed the resolutions passed in the previous conferences and discussed ways to develop Buddhist learning, co-ordination with other Buddhist nations, organising introductory Buddhist teachings, and developing the capability of the monks and scholars of the different schools of Tibetan Buddhism and Bon tradition. In his address to the conference on its concluding day, the Dalai Lama spoke about the importance of secular ethics and the need to do analytical study of the Buddhist texts so as to be able to get at the essence of the Buddha’s teachings and thereby gain real benefits from them. More than 66 representatives from 58 monasteries and Buddhist institutes, including the Gaden Tripa Rizong Rinpoche, the Sakya Trizin, the Karmapa Rinpoche, the Menri Trizin, the Shabdrung Rinpoche, the Drukchen Rinpoche’s Representative Khenpo Tenzin and the Taklung Tsetrul Rinpoche’s representative Kathok Gezey Rinpoche attended the conference, as did representatives from the Jonang tradition of Tibetan Buddhism, said the exile Tibetan administration at Dharamshala on its Tibet.net website Jun 20.